Tuesday's action from the Round 3 of the Hero I-League 2016-17 saw each of the home teams winning their respective matches. 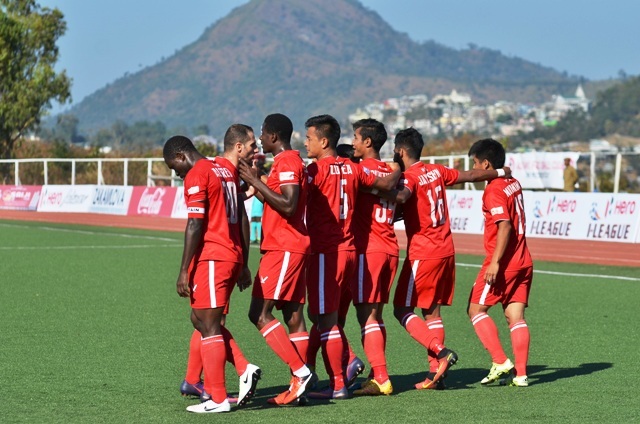 In the early kick-off at Aizawl, the North East derby saw Aizawl FC edging Shillong Lajong FC 2-1. Lalruatthara and Jayesh Rane scored for Khalid Jamil's side while Yuta Kinowaki scored from the spot very late to give Lajong a hope which never really saw the light of the day. Mahmoud Al-Amna was awarded with the Hero of the Match award for second time. Mohun Bagan crushed Minerva Punjab FC at home with a rampant 4-0 victory over the debutants in the Rabindra Sarobar Stadium. Ruthless in attack after Sony Norde's return, Mohun Bagan scored three times with just 32 minutes on the clock. Minerva defence were clueless while trying to stop the dancing feet of Haitian International Sony Norde while Darryl Duffy and Jeje Lalpekhlua applied the finishing touches. Both Duffy and Jeje registered a brace on their name as Bagan made in nine points from three matches. DSK Shivajians FC played host to another debutant Chennai City FC at the Balewadi Sports Complex and the home side prevailed with a 2-0 victory. Spanish playmaker who had been influential last term also, was the key man again as he assisted Kim Song Yong for the opener while scoring himself from the spot in the 55th minute. DSK Shivajians thus registered their first points in the league.